This is a better picture of my Diorama of Doom IV entry with my digital camera rather than my phone. I'm also playing around with different composition and layout on the base. 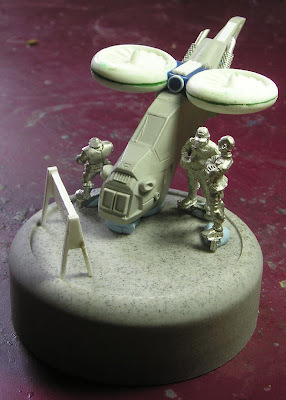 As the title suggests its important that something is out of sight of one of the miniatures! A couple of people asked me how the lift fans were made. I was going to make them by cutting the centres out of two 30mm lipped bases and glueing them back to back, then adding overlapping triangles of thin plasticard in the centre. I mentioned this on the Forum of Doom a while ago, and my mate Inso pointed me at these Evil Mushroom Games products. It looks like Evil Mushroom games had exactly the same idea as me and are casting and selling them, so I bought 4 from them. Having got them though I'm a bit disappointed. There are plenty of surface defects and bubbles in them - you'll see I had to fill the surface with squadron green putty and sand it back - twice. I hope to disguise any other defects with the paint. Fingers crossed! I may have been better making my own lift fans after-all.